In the 1983 poster 'Hiroshima Appeals', famous Japanese graphic designer Yusaku Kamekura decided to crop the borders in its third colour print. The poster was designed to depict a more aesthetic and appealing representation of the impact of Hiroshima bombings which took place at the end of World War II, so that people would not shy away from hanging it on their walls. No images of bulbous, threatening clouds of grey smoke or a gruesome trail of skeletons. In Kamekura's modernist poster, brightly burning butterflies in shades of blue, yellow and brown shoot down from the sky, hinting at the frailty and fleetingness of life. He crops the borders in the final stage to show one half of a butterfly—to convey the arbitrary nature of the destruction caused by the horrific bombings. This poster would go on to start a series in Japan where influential designers would contribute their own interpretation of the traumatic events in motifs which balanced beauty with sensitivity—and thus promote peace through posters. Visitors in Delhi can now see this 'flaming butterflies' poster in an exhibition being hosted by The Japan Foundation. Bringing together the works of 15 renowned Japanese graphic designers, the poster exhibition is a smorgasbord of clean, geometric compositions interwoven with abstract shapes, modern cuts and snatches of traditional Japanese imagery. All of the posters on display were made between 1980 and 1990, a time-period popularly known as Bubble Economy—characterised with inflated real estate prices, rapid urbanisation and an "information-intensified" society. Commercial enterprises invested a good deal in advertising and publicity around this time and employed graphic designers to experiment and interchange design ideas much more freely in a globalising world. The ill-effects of globalisation also could not go scot-free, though, and in this exhibition there is a strong undercurrent of poster as social art, placed at the intersection of culture, politics and commerce. Hence, there are the conceptual posters by Masatoshi Toda (b. 1948) for a jewellery exhibition with one shiny metal stone in jet black set against a grey background or the 11th Ishii award-typeface contest called "Shaken". Europe's largest cultural arts festival, Europalia, was hosted by Japan in 1989 and an intricately dressed up Japanese woman in traditional gear is stunningly poised against a soothing blue sky to show the cultural heft of Japan to the world. There is the iconic poster Nihon Buyo (Japanese Buyo Dance), offset print on paper, designed by the legendary Ikko Tanaka whose merging of the past and the present created an unsurpassed design heritage. In Nihon Buyo, a geisha is rendered in squares and rectangles. Striking posters for a Japanese cosmetic company for nail enamel, the Swiss watch company Rado, a newly opened FM station Osakan Power Radio in 1990—all bear testimony to a changing Japan and offer a peek into its social conditions. 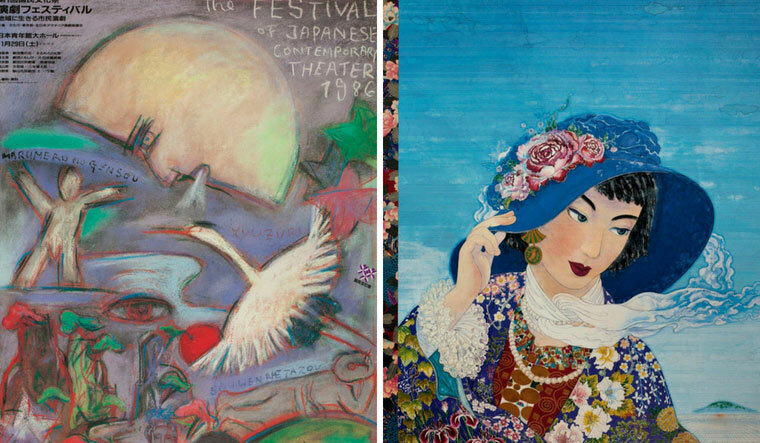 Contemporary Japanese Posters in on view till July 21 .